Ukiyo-e, the Japanese art form most familiar to foreigners, was not always highly appreciated. In its earlier days during the Edo period, ukiyoe prints were used to wrap fish, similar to how people use newspaper comics to wrap garbage. Though its reputation gradually improved, mainly due to its popularity with Westerners, it may be to no avail. Ukiyo-e and the traditional woodblock printmaking craft is dying in Japan. With less than 40 members in the crafts guild, all of them over 60 years old, and no apprentices, this art form is close to extinction. At 40, Canadian David Bull may be the youngest ukiyoe woodblock printmaker in the world. Living in Hamura, Tokyo, he is on a 10-year mission to recreate 100 prints originalyl designed 215 years ago by the artist Katsukawa Shunsho. Though using ukiyo-e's style of intricate 'singing lines' in black, then shading with pale colours, Bull's subject matter is not typical of ukiyo-e's depictions of hedonistic, decadent pleasures. Shusho's prints are drawings of famous classical poets with their writing in delicate calligraphy. Titled Hyakunin Isshu (Hundred Poems by Hundred Poets), it is a famous collection of poems written between the seventh and 13th centuries. Bull makes 10 prints a year for subscribers and has various demonstrations and exhibits. "Within my lifetime, dento hanga, the craft of traditional woodblock printmaking, may end. As in other small Japanese businesses, it is difficult to find employees. Young Japanese want to work for Nomura Securities, not apprentice at a trade for 10 years. The demand for dento-hanga is dwindling. While there is still work for master craftsmen, work for apprentices is no longer available and masters cannot pay an apprentice for 10 years of training," Bull explains. In his quarterly newsletter about his printmaking, Bull featured a master artisan, Keizaburo Matsuzaki. Instead of challenging himself with complicated art works, this skillful craftsman is reduced to making Christmas cards with snow falling on a temple roof. The production of Christmas cards is indicative of how foreigners are fond of traditional Japanese prints and ukiyoe designs in particular. "Ukiyoe appeals to Westerners because it fits within their notion of what Japanese art is supposed to be like - exotic with kimono-clad people. The Japanese are only interested in ukiyoe historically because it tells stories of old Edo, but there is no interest in continuing it because it does not relate to modern society." Bull says. Every January for the past three years, Bull has had a demonstration and exhibit of his work in Ome, Tokyo. Having come to Japan i 1986 to study printmaking, Bull began teaching English at his home to support himself while learning the craft. Bull started his 10-year project with little money and no recognition. To rent a space in expensive art galleries downtown was out of the question. 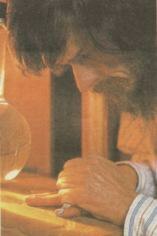 So in 1989 when his first prints turned out well, he sent them to various Japanese and English newspapers. His work drew responses - stories were written, people became interested, Bull's prints were sold. His hobby became profitable enough for him to stop teaching English and make prints full time. In 1998, Bull's project will be finished. The well-being of the ukiyoe craft may be even more questionable at that time. But Bull is not sure whether or not he wants to continue. "After the completion of my project, I could call myself a shokunin, a craftsman. At that point, I may want to take on new challenges or I may continue with traditional woodblock printmaking. I do encourage others to try it though," Bull says. "Three or four foreigners every year come over and try making a print. I tell them to continue working on it and bring it back after they are done. Unfortunately, no one has come back." 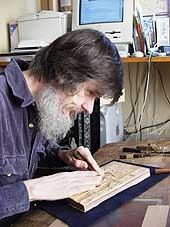 Making traditional woodblock prints requires the dedication of many craftsmen. But these trades are dying - the man who makes the blank cherry woodblocks for Bull is one of the last two men left in Japan doing it. The washi paper industry also is lacking in successors. The technology has become archaic. Many artists are willing to let ukiyoe printmaking die, allowing its modern descendant, the sosaku hanga (creative prints) flourish. Ukiyoe prints being made now may be the last ever made.